Must be a LICENSED NURSE; Can prepare written report / analysis; With valid driver’s license; Computer literate (MS PowerPoint, Excel); Preferably with EHS background; With 50 hours of BOSH for Nurses is an advantage. Graduate of at least 4 year IT related courses; With relevant work experience of 2 years in handling Server maintenance and Networking; With good Leadership Quality; Knowledgeable in IT Risk Management and the latest IT Solutions; Can work with minimum supervision; Willing to work overtime and holidays. Graduate of any 4 year course / Mechanical / Electrical Engineering; With or without experience; Computer literate; Should possess good analytical skills; Good in oral and written communication skills; Must be self-motivated; Can work under pressure and with good leadership; Must be willing to render overtime and work during holidays and Sundays. Graduate of ECE and COE for QA Engineer; Graduate of 3 – 4 years Electronics related courses for QA Inspector; With prior experience as QA in a manufacturing company is an advantage; Must have good analytical and communication skills; With good moral character and interpersonal skill. Must be a graduate of BS Electronics Engineering; Must have background in usage of Autocad and other CAD software; Experience in Automation Project Creation is an advantage; Able to work with minimum supervision; Willing to render overtime and/or Sunday work. College graduate of any Business related course for Buyer; At least 2 years College graduate of any course for Warehouse Assistant; Must be computer literate, good keyboarding skills with experience using word and spreadsheet; Experience with or knowledge in documentation, Planning, Purchasing, procurement and Supply Chain; Strong written and verbal communication skills. Graduate of any 4 year course; With or without experience in manufacturing; Computer literate; Good in oral and written communication skills; Self-motivated and Can work under pressure and with good leadership practice; Should possess good analytical skills; Willing to work overtime, holidays and on Sundays. Graduate of any Engineering course; Preferably with at least 6 months experience in a manufacturing industry; Proficient in Microsoft Office Excel, Word and Powerpoint; Basic knowledge in 7QC Tools, Statistical Process Control and Six Sigma; Willing to work overtime, or during holidays and Sundays. A graduate of Information Technology or Computer Science; With at least 3 years related work experience; Proficient in C++, the primary programming language to be used; Keen on details; Can work with minimal supervision; Above average oral and written communication skills; Provide project links if available. Male / Female; Candidate must be a Licensed Mechanical Engineer; Proficient in Autocad; Skills in Planning, budgeting and problem solving; With at least 1 year related working experience; Excellent communication skills both oral and written skills; Good interpersonal skills; Dynamic; Assertive; Determined. 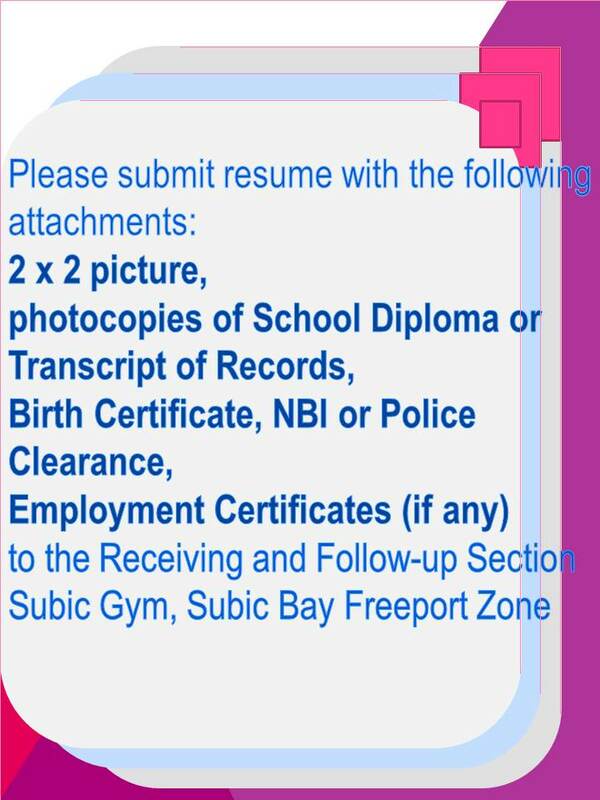 Graduate of BS Nursing; Must be a Registered Nurse, with updated PRC license; Preferably with at least 2 years of experience as a Healthcare Practitioner/Company Nurse; With good moral character; Computer literate; Can work on shifting schedule. Must be a graduate of any 4 year computer / Technical related course; Excellent command of written and spoken English; Excellent communication skills; Preferably 1 year(S) experienced Employees specializing in IT / Computer Software or equivalent; Flexible and able to work in a team; Basic knowledge in computer networks and troubleshooting, network standards, windows 7, windows server 2998/2012; Proficient in Microsoft productivity tools; Can create technical documents. Male / Female; Graduate of 2 or 4 years course; With 2 – 3 years experience; Have knowledge on C-Sharp, SQL Server, Visual Studio, PHP and MYSQL. Male; Graduate of BS Industrial Technology major in Machine Shop or any Technical related course; Must have at least two(2) years experience in handling Conventional and/or Computerized Numerical Control (CNC) Machines; Know how to operate Milling Machine, Vertical Machining Center, Drilling Machine, Hydraulic Press, CNC Machine, Lathe Machine, Tapping Machine Gear Cutting, Band Saw and other related machines; Able to express himself in spoken and written English; Willing to work under pressure; Can work and think fast accurately. Male; Equipment operator are specially licensed and trained individuals who work on heavy equipment at construction sites; Candidate must possess Professional License with restriction as Heavy Operator; High level of coordination skills and ability to work without supervision; Has good moral character. Candidate must possess Bachelor’s / College Degree in Education / Teaching / Training or equivalent; Able to work under pressure; Flexible and multi-tasking; Must possess eagerness to teach children-middle school students; Willing to undergo training; Ability to showcase great interpersonal skills; Related work/training experience in ESL is an advantage. Male / Female; Undergraduate / Vocational Technical course graduate; Fresh graduates are encouraged to apply; Knows how to design, must knowledgeable and know how to use AutoCad (3D/2D); Willing to be trained; Willing to render overtime. Willing to learn new information; Physically and mentally fit; Can work for long durations of time; Can withstand work pressure; Team player; Friendly, courteous, cheerful; Active listening and effective communication skills both Filipino and English. Graduate of related Vocational course; (Cookery NCII); At least 6 months experience in relevant restaurant department needed. At least College level; Can lift heavy objects alone; Willing to learn new information; Physically and mentally fit; Can work for long durations of time; Can withstand work pressure. Male / Female; College level or Vocational course related to the position; Minimum of 1 year working experience as Automotive Electrician; Hardworking and can work with minimal supervision.